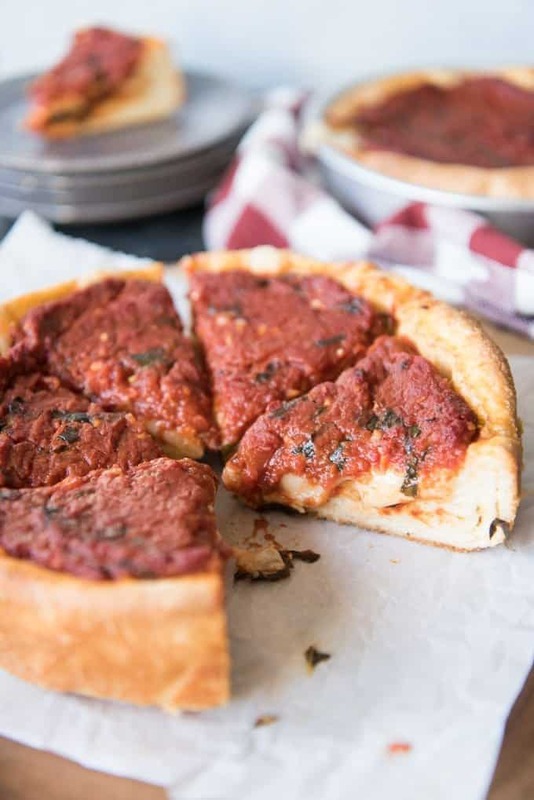 Chicago Deep Dish Pizza has a buttery, flaky crust and a thick layer of gooey, melted mozzarella cheese with a satisfyingly rich and thick tomato basil marinara sauce. You’re gonna’ need a fork, not just your hands for this pizza! It’s Friday again and that means pizza night! Readers of this blog will know that I love the tradition of making homemade pizza on Friday nights. Not every Friday, but often enough for it to be a tradition. 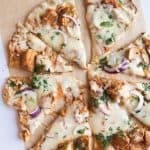 I’ve posted before about our favorite Four Cheese Pizza with Tomato Basil Arugula Salad and the more exotic Chicken Tikka Masala Pizza, but today I thought I would post another pizza recipe that we LOVE that is totally different from all the others. 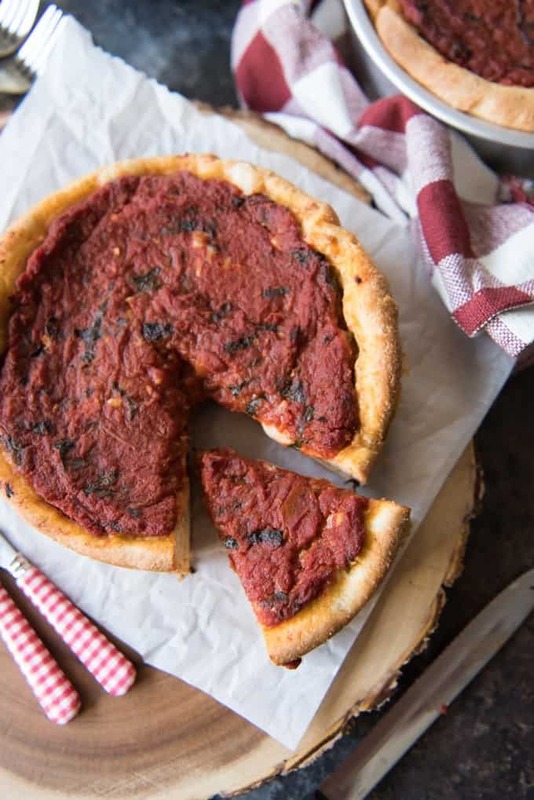 It’s Chicago Deep Dish Pizza and it is totally unique and out-of-this-world good. Now, honestly, I’ve never been to Chicago. I’ve never eaten at Gino’s East. So I can’t tell you truthfully that this is super authentic or just like the ones you might get at a Chicago pizzeria that specializes in the deep dish pizza. But I CAN truthfully tell you that once you taste this, you won’t care about authenticity levels. And my guess is that this is pretty authentic anyway, despite my inability to verify the veracity of my claim. 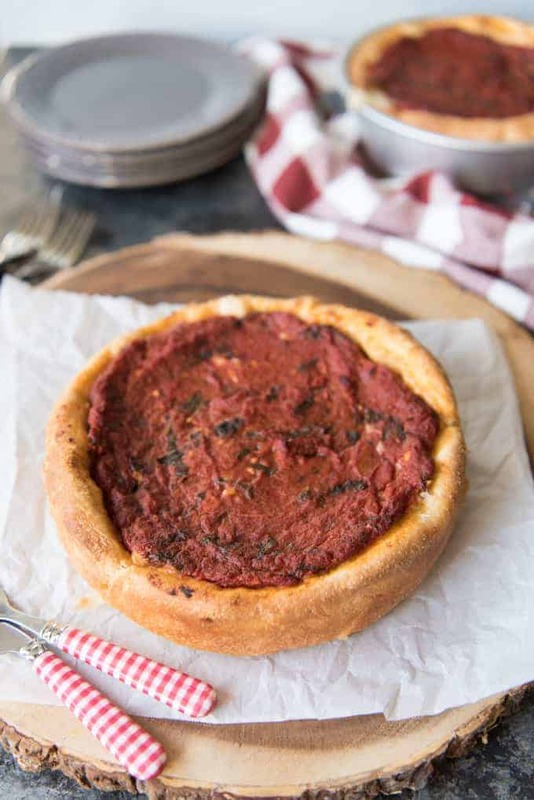 Somebody who has been to Gino’s East in Chicago, make this and you tell me, m’kay? Or fly me out there and I’ll report back. Really – I’d be happy to do it. 1. A laminated, cornmeal crust. 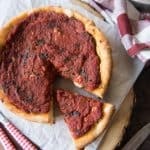 The crust on a deep dish pizza is totally different from the ones you get on most pizzas for a couple of reasons. The first is that there is some cornmeal added to the pizza dough which gives it extra texture and flavor. 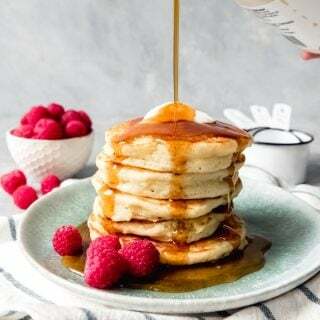 But then once the dough has risen, it gets “laminated” which is a process of creating flaky layers in a dough or pastry by adding butter to the dough and then folding and rolling it so that thin layers of butter are locked between the dough. Don’t be intimidated, it’s easier than it sounds, especially for this crust. I’ve got some pictures for you in a sec to show you how I do it. 2. Baked inside a cake pan for a high edge. 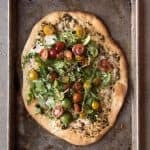 Instead of letting the dough lay flat on a pizza stone or baking sheet, you are going to tuck it into a round cake pan generously greased with olive oil (which is going to add to the wonderful flavor and texture of the crust) then fill it up with cheese and sauce. When the pizza is done, the crust will stand high and hold in all that cheesy, saucy goodness! 3. The sauce goes on TOP of the cheese. Sounds backwards, I know, but it’s how it’s done. 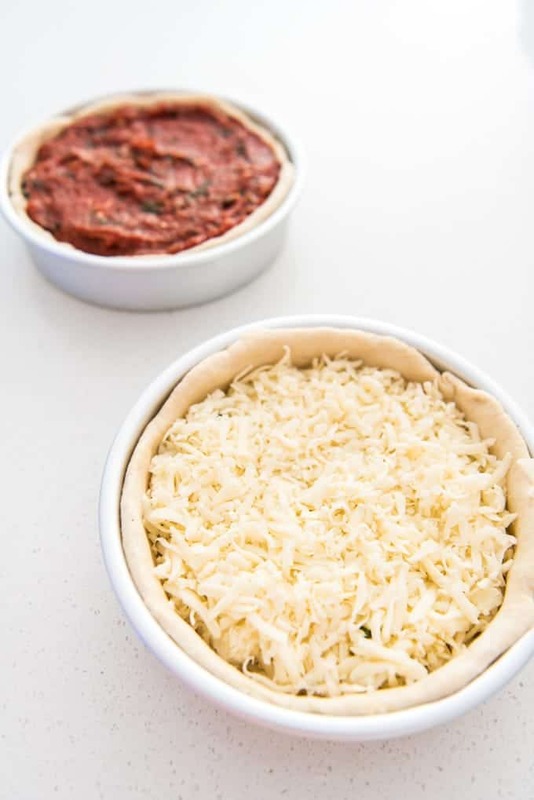 The cheese creates a barrier between the sauce and the crust so that the crust doesn’t get soggy while the pizza bakes and the cheese doesn’t burn during the longer cook time. And speaking of sauce, the one you are going to use in this recipe is just a Classic Homemade Marinara Sauce that I have posted about on here before. It’s total perfection with simmered crushed tomatoes and fresh basil and olive oil added in at the end. So let’s talk a little more about laminating your dough here, shall we? It’s one of my favorite techniques and if you have never tried it before, this is the perfect recipe to get familiar with it because it is so easy and forgiving. After mixing your dough and letting it rise, you are going to dump it out onto a clean surface, just like with any old pizza dough. 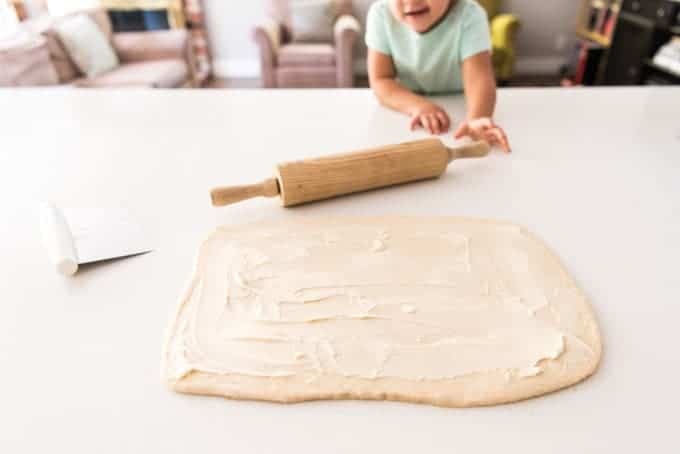 Except instead of rolling it out into a circle and topping it, you are going to roll it into a 15×12-inch rectangle and spread soft butter all over the top of it. I made this batch while Clara was at Kindergarten, but Rose was my little helper. 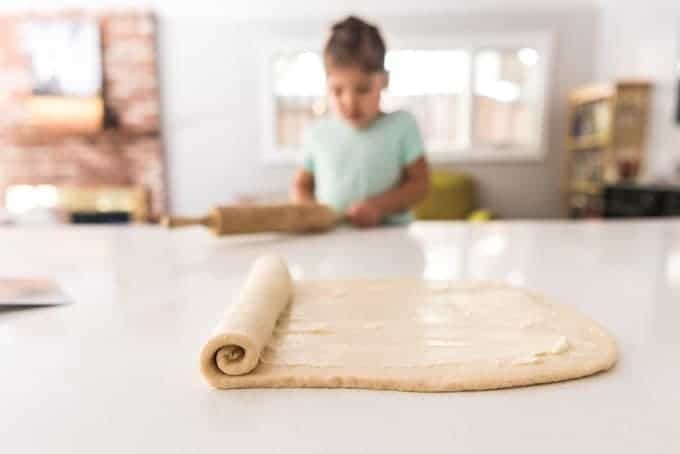 The rolling pin is definitely my girls’ favorite kitchen tool and they especially love it when I give them a little piece of extra dough for them to roll out on their own. You don’t want your butter melted for this step or it isn’t going to create the tender layers inside the crust that you are looking for. 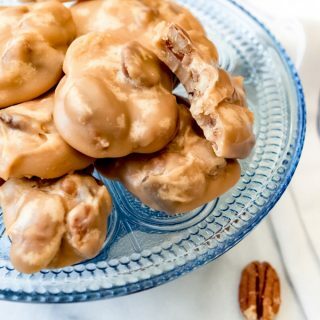 Other recipes requiring lamination like puff pastry actually have you use cold bricks of butter that you roll out with the dough, then fold and roll and fold and roll again and again to create the layers of cold, cold butter and dough. This is a middle ground where you just want your butter soft enough to spread over the dough but not so that it will run off the edges or anything. Then you roll this baby up almost like cinnamon rolls except that instead of rolling the long side, you want to roll the short side of the dough. What this is doing is creating all those layers of butter-dough-butter-dough without repeated folding and rolling to build up the layers. Hooray for shortcuts, right? This step creates probably 6-8 layers of butter and dough and that’s going to get tripled in just a second. After you get the dough rolled into a log, pinch the edges together and then flatten it out a bit with your rolling pin. Using a pastry cutter or sharp knife, divide the dough in half and then fold each half over itself into thirds. You are going to get two pizzas from this recipe, but don’t fret. They will both get eaten, I promise. They are small – much smaller than the regular pizza that we are used to – and one of them only serves 2-3, maybe, MAYBE 4 people if a couple of them are kids and you can restrain yourself to just one slice (which you can’t. just sayin’.). And anyway, if there are leftovers they are so, so good the next day. Don’t fret that there will be too much pizza. But back to the dough, after folding each section into thirds, pinch the edges together as best you can, forming a sort of a ball of laminated dough (and conveniently tripling the number of layers of butter & dough so you end up with probably about 20-25 layers. Not that anyone is counting, but still, this technique is why this dough is so unique and rich and wonderful! The balls of dough go back into the bowl and covered tightly with plastic wrap before going into the fridge for a final rise which gives you just enough time to shred your cheese and make the marinara sauce. Then its just a matter of coating each pan with a little olive oil, rolling the dough out and lining each pan with it, and then filling each pizza with cheese and topping it with sauce. It’s going to look like too much cheese, but trust me, it’s not. It will bake into the most perfect, cheesy, oozy layer ever, uniting the sauce and crust and creating a truly amazing pizza. Just, please, for the love, wait 10 minutes after pulling the pizzas out of the oven before slicing into them or else all that molten cheese is just going to pour out. Giving it that time to rest helps it set up just enough so that it holds up when you slice it. It’s also just enough time to throw together a spinach or Caesar salad to serve alongside the pizza. 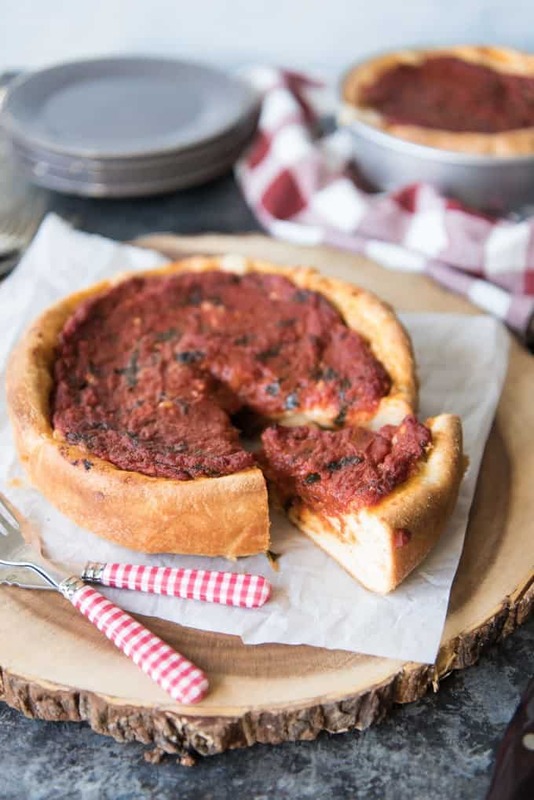 One last note – I don’t add extra toppings to my Chicago deep dish pizza. You can throw in pepperoni or veggies or cooked Italian sausage on top of the cheese before adding the sauce, if you feel like it but I keep it classic, even though I’m not typically a plain cheese pizza kinda’ girl. 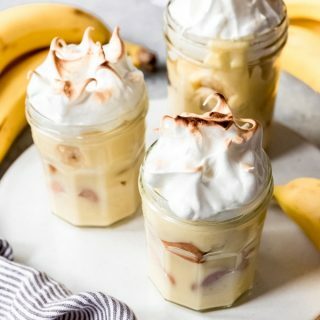 I keep telling myself I’m going to try some variations and come up with another version besides just cheese, but then I never do because why mess with perfection! 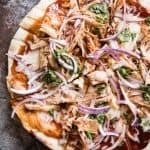 I know that making pizza at home takes extra time since it involves dough rising and prepping sauces and all that, but one thing I love about it is that during the time while the pizza is baking I can usually clean up the mess so that we have a clean kitchen by the time dinner is served. Do you have any weeknight dinner traditions like Friday pizza night? I’d love to hear about them in the comments section! 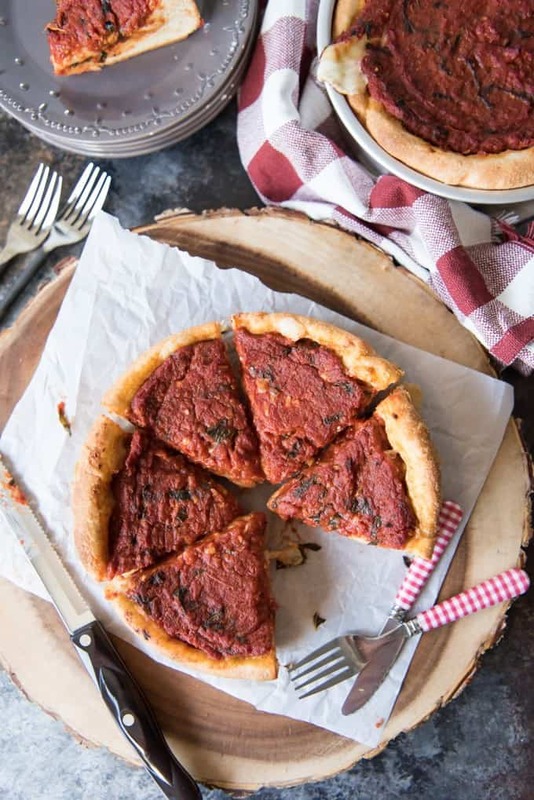 Chicago Deep Dish Pizza has a buttery, flaky crust and a thick layer of gooey, melted mozzarella cheese with a satisfyingly rich and thick tomato basil marinara sauce. You're gonna' need a fork, not just your hands for this pizza! 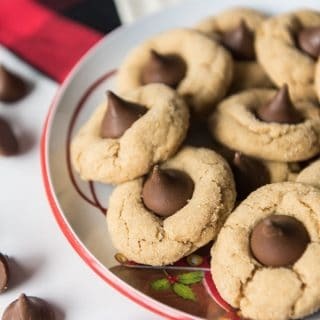 In the bowl of a stand mixer, combine the flour, cornmeal, yeast, sugar and salt and mix on low speed with a dough hook for 1 minute. Melt 3 tablespoons of the butter and add it, along with the water, to the dry ingredients. Leave the remaining 4 tablespoons of butter out on the counter to soften. Mix on low for 1 to 2 minutes, until combined, then increase to medium speed and knead for 4 to 5 minutes, until the dough is smooth. 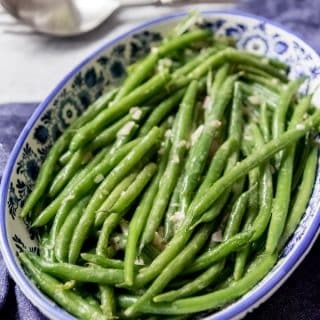 Pour 1 tablespoon of the olive oil into a large, clean bowl and rub it around the sides to coat the bowl. Transfer the dough to the bowl and give it a turn to coat it in oil so it doesn't dry out. Cover tightly with plastic wrap, then allow the dough to rise in a warm location for 1 hour, until nearly doubled in size. 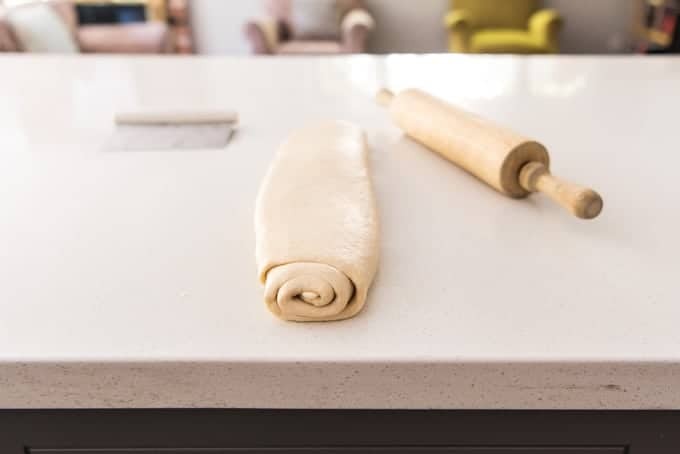 When the dough has risen, turn it out onto a clean, dry work surface and roll it into a 15x12-inch rectangle using a rolling pin. 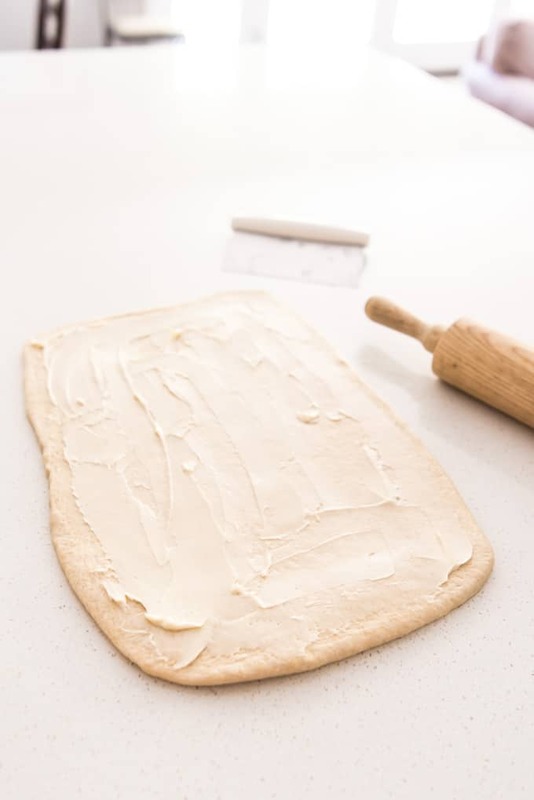 Use an offset spatula or butter knife to spread the remaining softened butter evenly over the dough, leaving a 1/2-inch border along the edges. 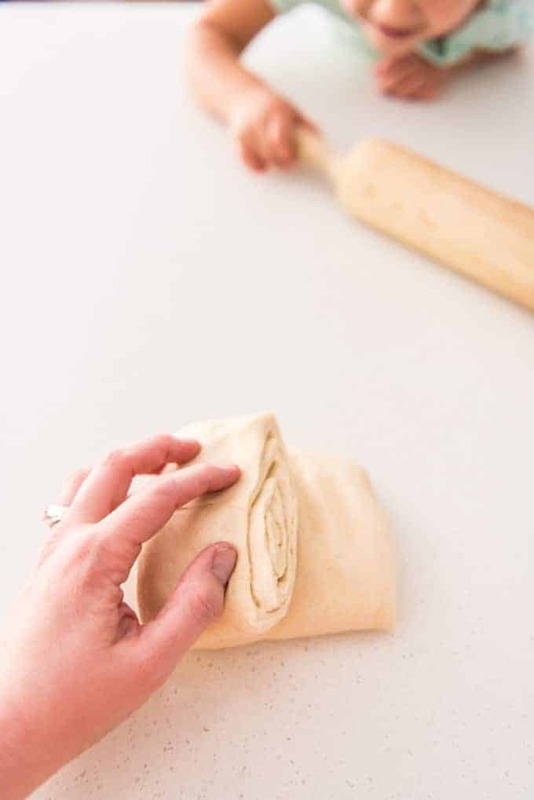 Roll the dough into a tight cylinder (like making cinnamon rolls) starting from the short edge, and pinch the edges together. With the seam side down, flatten the dough into an 18x4-inch rectangle, then cut it in half crosswise. Fold each portion of the dough over itself into thirds, then pinch the seams together to shape into two equally sized balls. 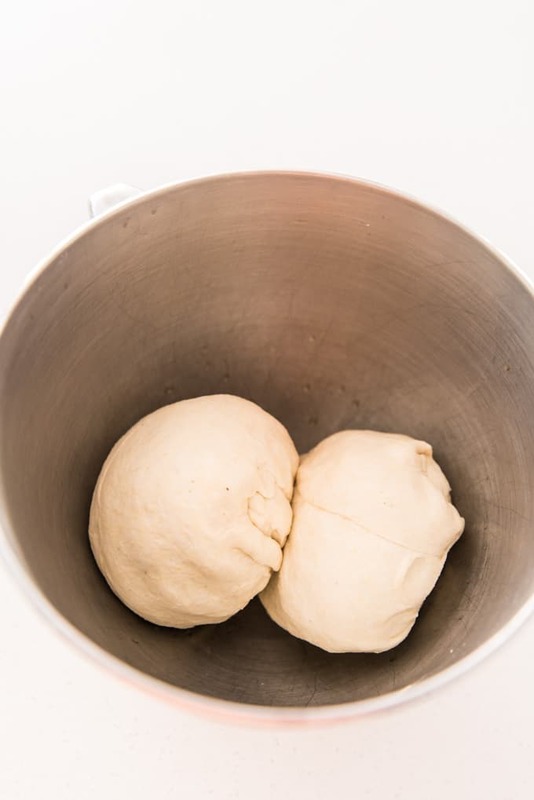 Return the dough to the oiled bowl, cover tightly with plastic wrap again, and allow to rise in the refrigerator for another 45 minutes, until nearly doubled in volume again. 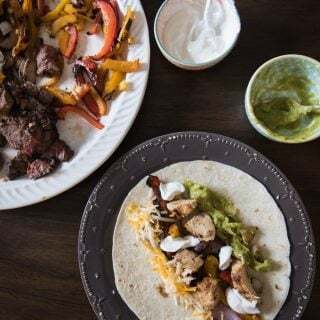 While the dough is rising in the refrigerator, prepare the marinara sauce according to the recipe linked in the notes below. Shred the mozzarella cheese and set aside. Divide the remaining 4 tablespoons of olive oil between the two cake pans and coat the bottoms and sides well. Preheat oven to 425 degrees with the oven in the lowest position. To assemble the pizzas, roll out each ball of dough, one at a time, on a clean, dry surface into 13-inch discs about 1/4 inch thick. Transfer each disc to a prepared cake pan and lightly press it into the corners and up the sides. Sprinkle 2 cups of the shredded mozzarella into each pan, then spread 1 1/4 cups of the marinara sauce over the cheese. Sprinkle each pizza with 2 tablespoons of Parmesan, if desired. Bake the pizzas for 20 to 30 minutes, until the crust is golden brown. Remove from the oven and allow the pizzas to rest for 10 minutes before slicing and serving. You can get the recipe for the classic homemade marinara sauce here. Recipe and method lightly adapted from The Complete America's Test Kitchen TV Show Cookbook. I’m from Chicago and it looks pretty darn close to Gino’s East! Probably better! I can’t wait to go home for Thanksgiving and get pizza! I’ve had Chicago pizza but have never made it. 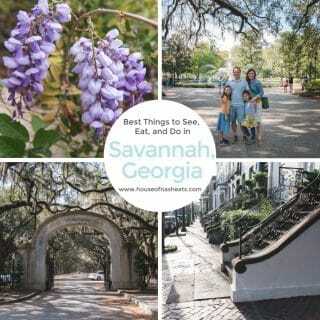 Thanks for the beautiful pictures and recipe. Looks SUPER!